According to the latest report from Gartner Research about the Worldwide Operating System Revenue and market share from companies and vendors, It has been declared that Microsoft is still dominating in making of Operating Systems for PC's, according to the amount of revenue it generates. Last Year in 2010 Microsoft had $23.848 billion revenue from its Operating System business, which gave it a 78.6 percent share of the entire worldwide OS market for that year. Earlier this week Gartner more said in its press release that worldwide revenue for OS software came in at $30.4 billion, which was an increase of 7.8 percent compared to 2009. While Microsoft still has a commanding lead in OS revenue, the report did say that Apple's Mac OS was the fastest growing in revenue in 2010 in terms of the client based OS business. The Mac OS grew by 15.8 percent that year and with revenues of $580 million. Even with that growth the Mac OS only has a 1.7 percent market share of the Client based OS systems. Overall the client OS section of the business grew by 9.3 percent in 2010 while server based OSs grew its revenue by 5.7 percent. 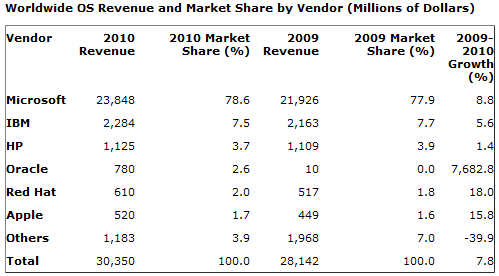 IBM and HP were the number two and three companies in worldwide OS revenue, respectively, in 2010. IBM owns three OSs and showed the highest growth with its AIX OS with 9.2 percent growth. HP's HP-UX OS shows a 3.2 percent growth in 2010. Red Hat's version of Linux is the biggest in the overall Linux server market. Its revenues went up to $592 million in 2010, an 18.2 percent growth and a whopping 58.2 percent share of the entire Linux server OS market. Check out following chart comparing Worldwide Operating System Revenue from different companies.